« A Core Neighborhood Plan? PALOLO SOLERI (June 21, 1919 – April 9, 2013). 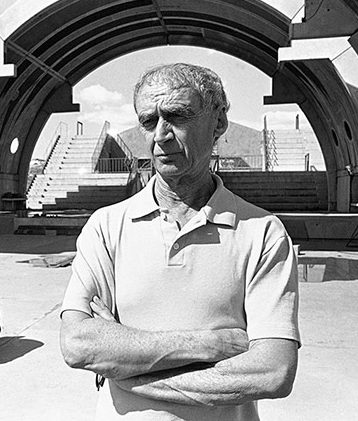 Now, with only his legacy and futuristic forms in our memory, Paolo Soleri’s contributions will be live on internationally. His concepts will be moved forward by new generations of Architects and Planners. His work is an important force in the shape of future human settlements. He was known for bold ecological forms and a revolutionary design concept he called Arcology. His legacy will be impacting as futuristic minded planners seek the right answers to what sustainable urban habitat is. 27 years ago I attended one of several weekend seminars at Arcosanti to further understand arcology. An account of one of Soleri’s seminars was published in Solar Earth Builder Magazine: Arcosanti Solar Greenhouse, A Hope for The Future. A polar opposite of modern building and planning stereotypes, Arcosanti was known as “philosophy in action”. It soared beyond a pure philosophical proposal. Arcosanti and Soleri’s nearby residence compound at Cosanti gave architectural substance to his ideas. Soleri perfected the notion of sustainability before it was a household buzzword. He is the Frank Lloyd Wright of sustainable urban form. His work will guide future studies of habitat in a challenging era of global warming and critical urban design problems.